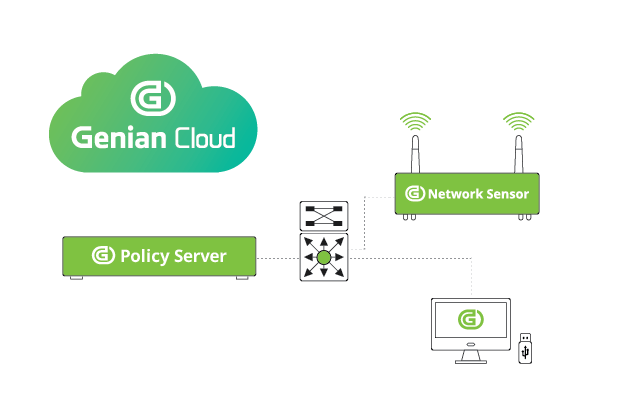 Genian NAC provides network surveillance and performs ongoing compliance checks to ensure that all connected devices are automatically identified, classified, authorized, and given policy-based access control. It also provides all the major features that network managers expect, such as NAC-driven IP Address Management (IPAM), Desktop Configuration Management, complete security control over Wi-Fi access, automated IT security operation, IT asset management, and much more. Genians NAC provides both on-premise and cloud-based deployment options, providing for ease of deployment and ongoing management. A brain (Policy Server) with two handymen (Network Sensor and Agent) can fortify your entire network without disrupting existing network configurations. All components can go into a single server except the Agent. The Network Sensor can be separated from the Policy Server to manage remote sites and achieve extended Wireless visibility. Agents can be used as Wireless Sensors as well.